The Mudd Library welcomes A Stone of Hope: Black Experiences in the Fox Cities, a “pop-up” museum exhibit that examines black history in the area from the 1700s to the present. The exhibit, that began in June on Appleton’s Juneteenth celebration, will be traveling for two years, displaying at numerous sites around the Fox Cities and Appleton area. The exhibit will be on display on the Mudd Library’s 2nd floor from September 29th-October 31st, 2014. 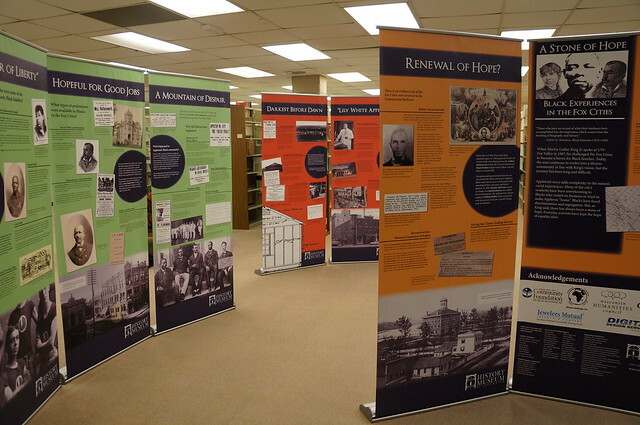 Twelve educational floor banners make up the exhibit, sharing stories and photographs of individuals, businesses, and events that have contributed to the historical narrative. Lawrence University Archivist Erin Dix ’08, Research Intern Sarah Golden ’15, and Music Librarian Antoinette Powell have all contributed research to the exhibit. More information on the Stone of Hope exhibit and other locations it will be showing at can be found here on the History Museum at the Castle’s website. Check out our Flickr page for more photos of the display.